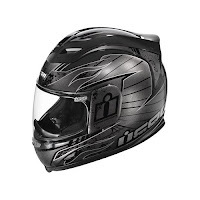 As part of the wealth of new product Icon is releasing in Fall 2010, the already mega-popular Icon Airframe Helmet is coming out in three new designs. Already known for flowing enormous quantities of air and providing an aerodynamic and comfortable ride, the aggressively-styled Fall 2010 Icon Airframes are sure to turn heads in the street. First up, the Icon Airframe Construct Helmet offers a great balance of performance and visual design. The 'Naked' finish utilized by Icon is an amber weave, soaked in a rich gloss coat, all sitting atop a Fiberglass-Dyneema-Carbon Fiber chassis. It's incredibly light, resilient and strong, and ships with a dark smoke shield to add to the already maxed-out sleekness of this helmet. Like the rest of the Airframes, the Construct is All World Standard, meeting DOT, ECE, SAI & SG certifications. The fans wanted a helmet that represented the day of reckoning, and Icon delivered to a T. With a sword-wielding skeletal cavalryman riding on the back of a half-decayed horse, the Icon Airframe Apocalypse Helmet exists for all those armageddon-obsessed riders out there. Icon rounds this helmet out with flames flying out and around the horseman and his chariot of destruction with a sword slicing behind the 'Apocalypse Airframe' logo on the back of the helmet. Of course, it offers all the great features of the other Airframes, but the hellish graphics set it apart from its brethren. Those riders looking to be slightly more subtle but still let the rest of the road know they're fast will be happy with the Icon Airframe Lifeform Helmet. Building on the graphics scheme of the Icon Airframe Carbon Lifeform Helmet, the design of the Lifeform is all aggressive lines and sharply-pointed flames. Available in black, bright blue and blazing red, the Icon Airframe Lifeform looks like pure speed and aggression. The "winged crest of defiance" and "tangential lines of attack" will let everybody know what you're doing when you hit the streets. And you'll be cool, comfortable and protected while you're ripping around with this lid on. Icon continues to construct gear that delivers the performance and style that aggressive street riders desire. The advanced designs and technologies utilized are setting Icon apart from the competition. They take standout products and make them better. Time after time. And the new Icon Airframe Helmets are no stray. Check out the full collection of Fall 2010 Icon Gear and our entire selection of motorcycle helmets at RevZilla.com.